UPDATE: The Tremont House Jazz Series has been extended through Dec. 19 (excluding Thanksgiving). The Tremont House, A Wyndham Grand® Hotel, is hosting a new “Fall Jazz Series.” Beginning on Thursday, Sept. 26, the Island Jazz Project will perform on Thursdays from 6 to 9 p.m. in the Toujouse Bar. Island Jazz Project is led by pianist Bryan Lee Guevin and accompanied by bassist Reg Loudermilk with guest appearances by drummer Jake Walsdorf and saxophone player Dr. Giovanni Piovesana. The Tremont Fall Jazz Series is free and open to the public. The hotel is expanding its Martini menu and offering new bar bites to tie in with this series. The Tremont House, A Wyndham Grand® Hotel, is owned by the late Cynthia and George Mitchell family as part of Mitchell Historic Properties. The Tremont House is a 119-room boutique style hotel located in the heart of The Strand National Historic Landmark District and Galveston’s Downtown Cultural Arts District. This historic hotel features 14,000 sq. ft. of meeting space, a bistro-style café, fitness center and two bars for entertainment – the 1888 Toujouse Bar and The Rooftop Bar. For reservations, call (409) 763-0300 or visit www.WyndhamTremontHouse.com. 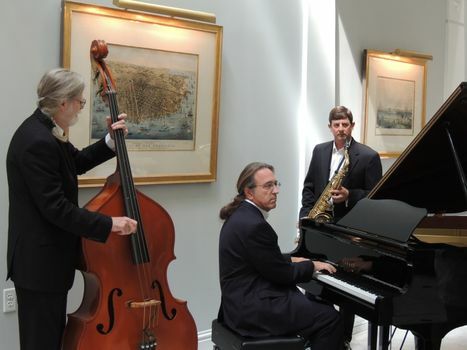 The Tremont House, A Wyndham Grand® Hotel, is hosting a new “Fall Jazz Series.” Beginning on Thursday, Sept. 26, the Island Jazz Project will perform on Thursdays from 6 to 9 p.m. in the Toujouse Bar.